You can’t tell, but I’m actually really excited for this post. Two delicious things- macarons AND ice cream together! I’ve always wanted to try making these since I’ve seen pictures of the giant macaron ice cream sandwiches from a place called MILK in Los Angeles, CA. I have never visited their shop to try the sandwiches, but I can only imagine it’s nothing but pure heaven. It’s on my list of places to go the next time I’m in L.A.
A few factors finally prompted me to make these ice cream sandwiches. 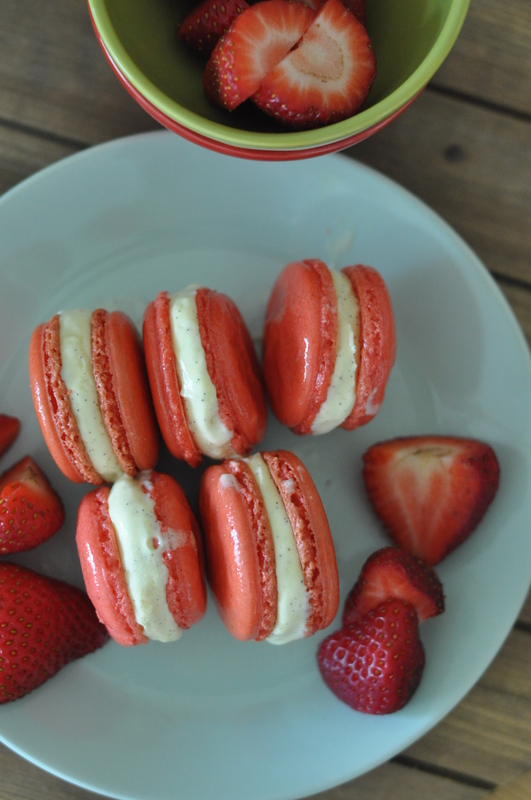 First, I was making some strawberry macarons for a friend who requested them for her daughter’s high school graduation. I had extra shells left, so I set them aside for this project. Second, I really, really wanted to make ice cream since the weather is getting warmer and I wanted to use the copious amounts of Whiskey we have on our shelf. Third, I had this article pinned to my ‘Baking Ideas’ board on Pinterest for some time now and it was always there for inspiration. And lastly, I was talking to my friend, Yao, and he asked me if I ever made ice cream sandwiches before. Prior to that, I told him I have not but it was the one thing I have on my to-bake list. Our conversation went on about ice cream and I was definitely inspired. 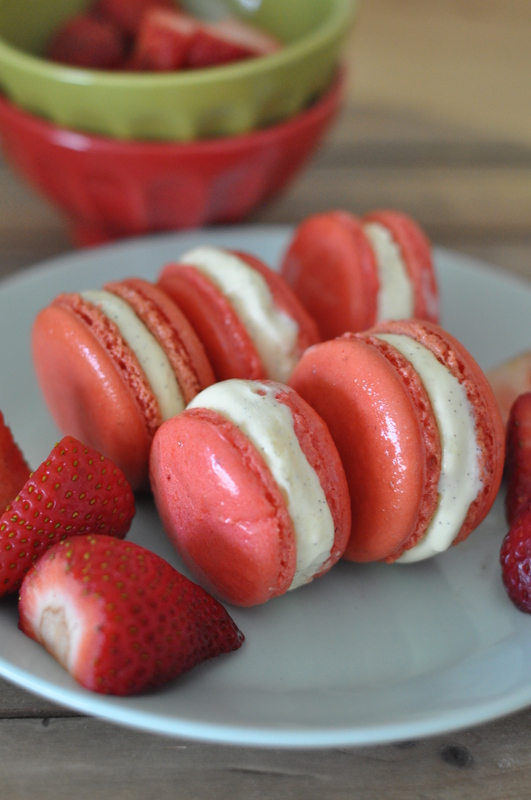 A couple of days later, the strawberry macaron vanilla Bourbon ice cream sandwiches were born! I had the macaron shells already made, so the following day I made the custard for the ice cream. That chilled overnight in the refrigerator and was processed in my ice cream machine the next day. I then let the ice cream set up in the freezer overnight to firm up. Then working quickly, the macarons were sandwiched with the ice cream. It may sound weird, but the combination of strawberry, Bourbon and vanilla together? Trust me, it was a great combination of flavors! I used the same macaron recipe found here. I omitted the vanilla powder. When processing the almond flour and powdered sugar, I added about 2 tsp of freeze dried strawberries for a more pungent flavor. 1. Heat the cream, milk, sugar and salt. Add the vanilla powder remove from the heat, cover and let steep for about 20 minutes. 2. In a separate bowl, whisk the the yolks. 3. Temper the yolks with some of the heated milk mixture. While you’re slowly adding the milk, use your other hand to whisk the mixture constantly. This prevents the yolks from curdling. 4. Add the yolk-milk mixture back into the pot and heat on medium. Using a spatula, continuously stir and scrape the bottom of the pot. 5. Heat until the mixture thickens and coats the back of a wooden spoon. 6. Strain the mixture into a clean bowl. Place bowl over an ice-bath to stop the cooking. 7. Allow the ice-cream base to cool in the refrigerator overnight. 8. Churn ice cream the next day. 9. Once the ice cream is done, fold in the 2 tsp Bourbon using a spatula. 10. Place ice cream in a clean container. Allow it to firm up in the freezer. 11. 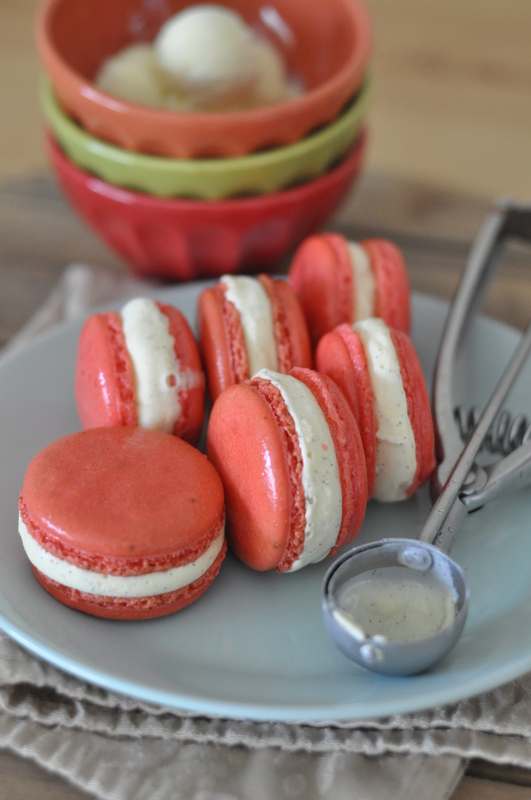 Once ice cream is firm enough, sandwich macarons. Work quickly as ice cream will become soft. 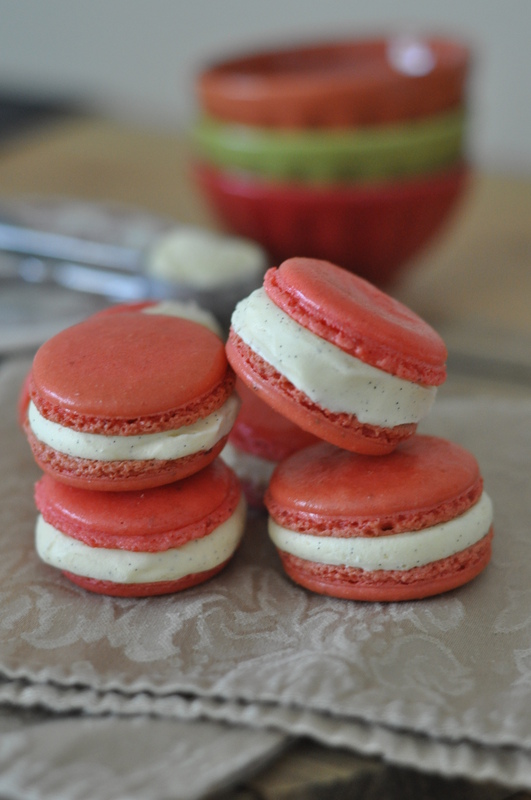 Sandwiched macarons can be stored in an air-tight container in the freezer. Macaron shells will remain soft and ready to eat.